Television is telecommunication where we get entertained. Basically Tv is placed in a living room, lounge or even in bedroom. We usually watch tv when we are leisure and some people like watching tv all the time. We get socialized and knows the current situations around the world. If you feel lonely or bored at home then you can on your tv where you feel pleasant or get relaxed by watching tv shows, entertainment programs and may even reduce your stress or depression. So, where you are going place your television is based upon your interest. 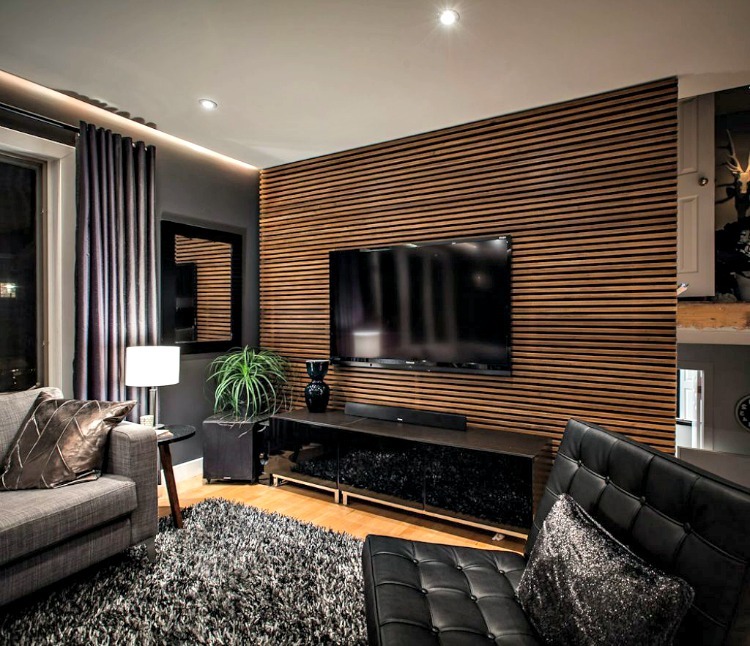 Here are some ideas how to design a Tv wall unit. This image shows you a modern Tv wall unit design. The scarlet red is sprucing the entire living room. Here the interior is decorated with wooden panelling of chocolate brown in contrast with white which looks amazing. 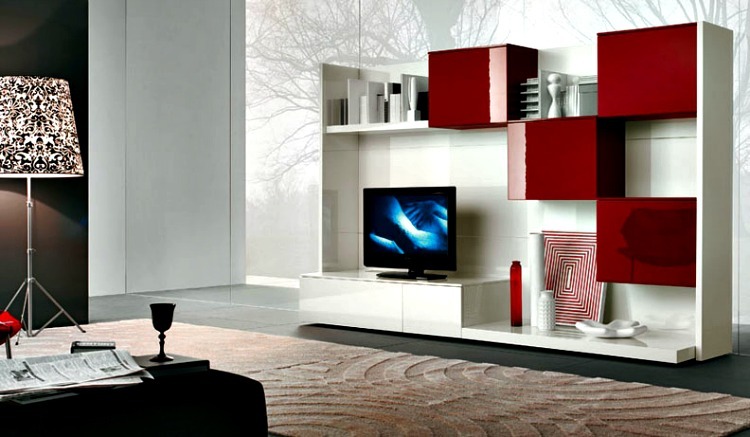 The Tv wall unit is designed very modish with wood and has closet, storage cabinets of gorgeous red. The television is placed on the wooden cladding and some accessories on the closets. The flooring is made with the tiles and behind the wall cladding the wall is decorated with a wall paper which is elegant. In the view of this image you can see a plasma placed on white wooden cabinet. The interior is decorated with white which looks cozy and has a magenta wall paper which is eye catching in the room and it has a wall cladding of white color to store display items in closets or show case. The interior flooring is made of plain vinyl flooring with a black plush carpet. Here the room has a coffee table and couches for seating. The wall has an wall art which is good looking you can even place a painting there. The above design is simple and if you want to choose a small space interior for Tv unit choose this design. This image is a tv wall unit design in a living room. It has a LCD attached to the wall cladding which is behind. The wall cladding is stunning and is decorated with a closet of decorative items of gold accents. The interior has a wall paper of grey color and is well designed. In the wall cladding you can place some vases, here we can see it has a ornamental plant and an idol. The room has jalousie and casement windows for outdoor view and you can use draperies to cover windows. The room has chaises and the flooring is made with hardwood which is popular. 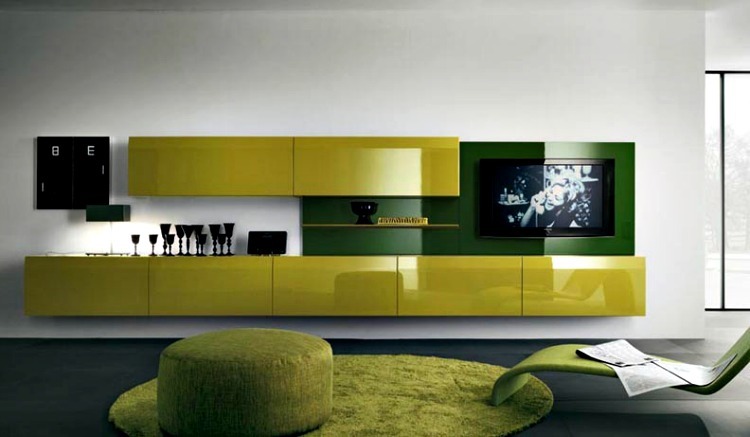 This image is ultra modern Tv unit wall design and looks stunning. Are you looking for a modern tv wall unit choose this design as it makes a great impression for your living room. The entire room is plain and simple. The interior is decorated with a wall cladding and has paneling of black color and has a chest of drawers for storing accessories and has two attractive organic metal display items. The interior has couches and the flooring has a textured carpet. In the view of the image you can see a dry wall interior which is plain and simple and the tv is placed on the wall cladding of juniper green which looks beautiful. The interior has wooden panelling of bright color and makes the room look ideal. The flooring is made with grey tiles and has laid a green berber carpet and has a colorful pouf and funky chair for relaxation. The panelling can be decorated with the display items. 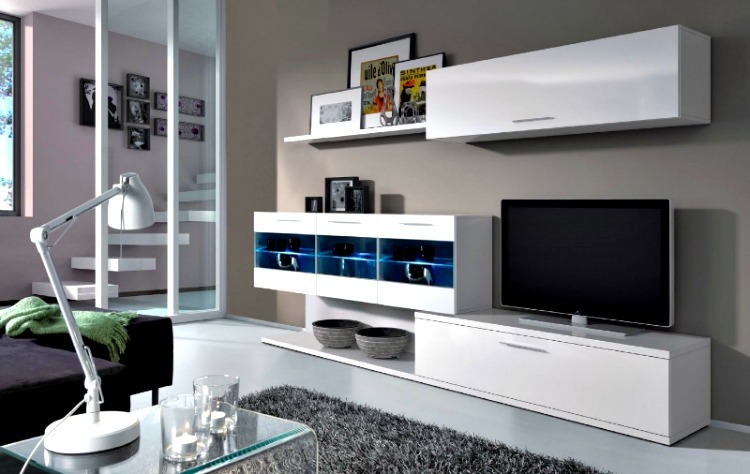 If you have a small space to design a living room so you can go with this tv wall unit design. The interior is decorated wooden cladding and the LED is attached to it and there is a cabinet made of glass and wood in which you can store display items and accessories. Here there is a ornamental plant which gives a fresh look to the interior. The false ceiling is a dry wall ceiling with lights and the room has picture windows and is decorated with the Tab top draperies. The room has a mirror which reflects the beauty of the interior. It has leather couches and lawson sofa with a saxony carpet. In the view of this image you can see an elementary design. The interior has a wall cladding of white wood and is decorated with beautiful display items of gold accents. It has a LED on it and you can place vases and flower pots of your choice. The flooring is made of plain vinyl flooring of beige soft color. The room looks jazzy with the wall cladding and has a pendant light hanging on to the roof. The balcony is decorated with the flowering plants and is floral. The room has comfy sofas, totally the interior is well designed with saturated colors and looks fabulous. In the view of the image the tv wall unit is well designed. Here the carpet is catchy with saturated earthy colors. The flooring is made with the tiles and has couches along with a coffee table to serve edible items. The interior is decorated with wooden cladding and has black panelling which is decorated with display items. The closet can be used to store books and accessories which adds beauty to the room. The tv is attached to the plain wall and the room has picture windows for looking exterior view. In the image you can view a living room with a tv unit. 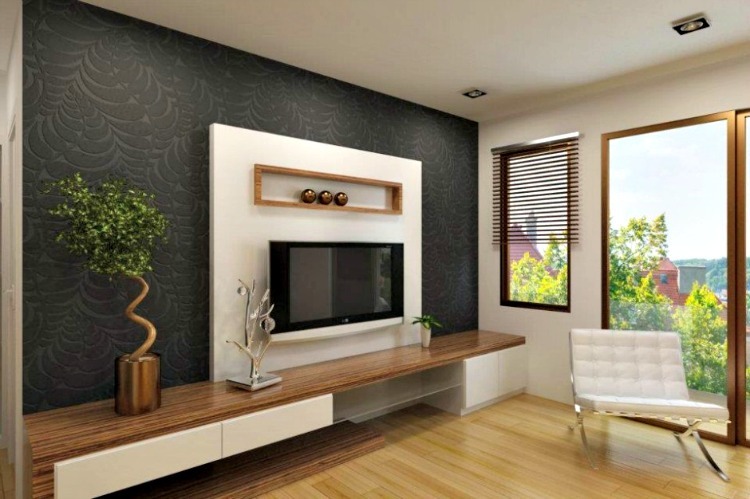 The interior is decorated with earthy colors and behind the tv you can see a plain wall paper and has white wooden panelling which looks loyal. There are cabinets to store messy things and the panelling has photo frames, display items and has ceramic bowls. The LCD is placed on the panel and there is a glass partition. There is a staircase without railing and the flooring is plain with a saxony grey carpet. The room has day bed and a glass table. The interior is decorated with cream color in contrast with black wall cladding. The ceiling is a suspended ceiling with a massive chandelier attached to the roof with ceiling lights. The room has wooden panelling behind the Tv wall unit and is decorated with slam pottery and flower pots. The interior has comfy sofas with cushions and a textured carpet. It has a modern centre table served with casual drinks. The wall has ikea gallery and is good looking.